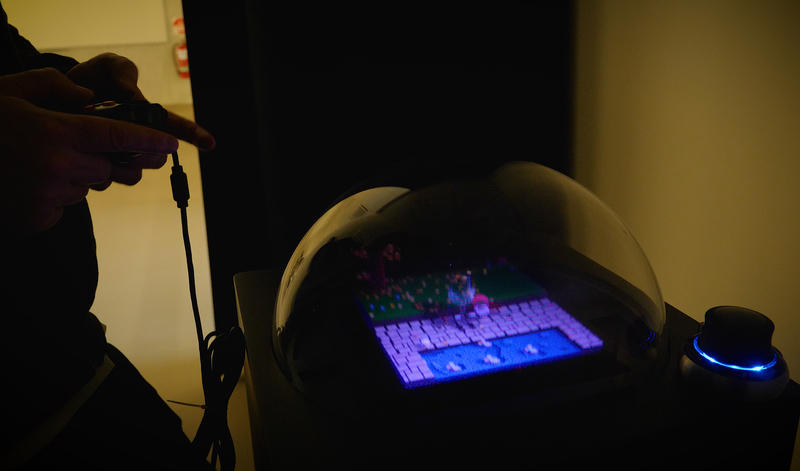 We are super excited that Lexaloffle’s Voxatron engine now runs on the Voxon VX1! For those that don’t know, Voxatron is an action / adventure game created with voxels. Joseph White, a New Zealander now living in Tokyo, started working on Voxatron around 2004. Way back then, Joseph had the notion that one day it would be playable on a volumetric display and be viewed from any angle in true 3D volumetric format. Joseph, being a good friend of Voxon’s, now has the Voxatron engine running flawlessly on the VX1 which we are pretty excited about. Joseph recalls his first time playing with a voxel demonstration by Ken Silverman, the designer of the Duke Nukem Build Engine, pioneer of 3D graphics and Voxon Photonics’ very own Chief Computer Scientist. Joseph zoomed in on the surfaces, looking at each individual voxel. He imagined little, blocky voxel characters running around the rigid terrain and with this concept now firmly implanted in his mind, the idea for Voxatron was born. Joseph started designing a game for a display of the future, a game which could be played on a volumetric display that hadn’t been invented yet. Joseph’s vision was to have “players seated 360 degrees around the interactive colour image volume of Voxatron.” His dream has now come true. Voxatron has been designed as an open playground for various styles of voxel-based gameplay and currently features a series of ‘virtual cartridges’ that contain some amazing rooms. Voxatron also comes with a cartridge editor and has a strong emphasis on creating and sharing content with other players. Have a look at some of the video footage below… Now this game was definitely created to be played on the Voxon VX1! Voxatron will be made available for all users of the Voxon VX1. If visiting Japan and wanting to meet Joseph and his wife Natsuko, as well as play Voxatron on the Voxon VX1 (yes, Joseph has one), then head along to Pico Pico Cafe on one of Joseph’s regular Saturday night open nights (see Pico Pico on Twitter for more details). A big thank you for Joseph White for helping in make this happen, it had been a long time coming!